Since 2014, from time to time, while biking out to the high school track or out on the trail with my high school cross country team, I would catch glimpses of a willowy, 30-something runner with long blonde hair and an observable limp. Over time, I noticed that the hitch in her gait was gone, and she was running faster. Now, three years later, I am training Ali Schaeffer for her first marathon. 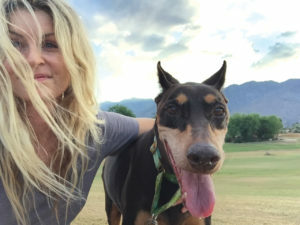 Her incredible comeback story follows. 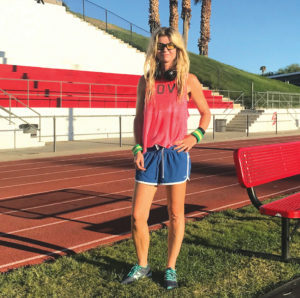 Ali was training for her third half marathon, returning to running in her thirties to recapture that something that was missing from her life. Ali grew up in Calgary, an outstanding student and a team MVP in high school track, volleyball and basketball. She lived for – and loved – competition. Ali had forgone college basketball to focus on her career objective, applied science/dental hygiene. Her patients adored her and her practice flourished. Life was good, but she missed the thrill of sports. The gym was not enough, so she took up long distance running, competing in 10Ks and then stepping up to half marathons, running each one faster than the last. Her life was complete. She was, in her words, in the best shape of her life. On May 9, 2012, finishing an eleven-mile training run and dreaming of pancakes a mile from home, everything changed in an instant. Ali’s life changed forever when, on that training run, a careless driver struck her at an intersection. She was pitched headlong through the windshield, thrown thirty feet, and lay bloodied and broken on the hard Calgary pavement, her long blonde hair soaked red with blood. Ali Schaeffer’s story is one of a long and still painful recovery and eventual return to running. She is a role model whose courage, perseverance, dedication, and a remarkable tolerance for emotional and physical pain are an inspiration. I lay there in the hospital with traumatic brain injury, 18 staples in my skull, three herniated disks and a torn MCL [knee ligament]. Unable to sit up, I would fall unconscious in mid-sentence, blood oozing from my ears. I am lucky to be alive today. Ali trains through the pain from an accident that almost took her life. The next two years of my life were consumed with rehabilitation including speech therapy, balance therapy, occupational therapy and a psychologist who forced me to document daily how horrible I felt and what I could not do. With all of the negative reinforcement, I fell into a deep depression. Eventually coming out of that, I was left with permanent post-concussion syndrome: light and noise sensitivity, continuous headache, dizziness, neuro-fatigue, aphasia [a communication disorder], insomnia, depth perception issues, hearing damage and lack of emotion. At times, and still today, I have to focus hard to tell the difference between a dime and a nickel. Spelling my name is a challenge and I fatigue easily. I struggled to do things that once came easily, now coupled with both pain and fear. During this first six months, my four rescue dogs passed away and my grief became unimaginable. I pushed away people I loved most. I had hallucinations, delusions, and suicidal thoughts. Grief, pain, and depression held me hostage and when my PTSD spiraled out of control, I began to isolate myself. I felt like my soul was slowly dying. When I was physically able, I escaped to Palm Springs. I was more comfortable around strangers. Those I loved most triggered my PTSD and traumatic memories. I wanted someone to save me. I started running again daily. My MCL gradually healed without treatment but the damaged disks, nerve damage in my hips and sacrum, and sciatica in both legs have resulted in a daily pain level between 7-10. I run anyway, always in pain, but running never makes it worse. Coach Vic reminds me that the endorphins produced by long-distance running are our internally-generated pain killers. I have used running for the last three years to burn off the excess cortisol in my brain that made me feel unstable and anxiety-ridden. Initially, I would run morning and night, often not recalling that I had run earlier. I was living my life in an altered state of injury and depression. Another piece of my old life is my adopted dog, Kiyah. She is 13 and tough as nails. She too has disabilities, but has shown me how to make the best of every day. I learn most from my dogs. Having lost my fine motor skills, I could no longer practice in the dental profession, so I went back to school to become a massage therapist. Giving my best therapeutic care to others helps them and gives me purpose. I now have a solid base of clients with chronic pain, and it has helped to slowly recover ‘me’ again. Between my work, my dog and running, I am gradually making a comeback; although I still get the physical reactions under stress (dizziness, raging cortisol, insomnia), but I refuse to fall down the rabbit hole. I never thought I would race again. My endurance, gait, speed and stamina have all taken a hit. My neuro-fatigue varies so much that I have lost my confidence. I had met Vic a few times over the past two years on my runs. He was one of several ‘nameless’ friends I would see out running or biking in the early hours. We would exchange smiles and waves. That was it. I decided I would do it. What you tell yourself daily molds who you are. Vic has shown me that. He has since worked with me one morning a week doing mile repeat intervals on the track, and joins me on my once-a-week long runs up to 21 miles. On October 22, Ali did cross that finish line – all 26.2 miles – in a very commendable 3 hours and 48 minutes. On Ali’s marathon debut, Coach Vic was beaming with pride and respect for the most courageous runner he has ever coached. For Ali, crossing that finish line was affirmation that while it may be excruciatingly tough, life really is what you make of it. Coach Vic Gainer has taken first through third in his division during his 30-year career as a competitive masters runner. Now dedicated to coaching, he has trained more than 2,000 marathon runners. Vic can be reached at vicgainer@aol.com. Thank you for publishing this article about my very dear friend. You have captured the true grit and determination of who she is and what makes her tick. To know her is an honor and to have her as a friend is a true blessing. Congratulations Ali…you rock!!!! Thank you so very much for your kind words. I have had the honor of getting to know Ali since I wrote this piece and agree 100%. She is an inspiration to all! Thank you for reading Desert Health! What a true miracle this story is!! Ali is a miracle herself…. her strength and will power to conquer even the most dismal of situations is magical! I have know Ali since high school, and yes she was a shining star then, and has risen to the top once again! One of my longest and dearest friends, I love her more each year we are blessed to have each others friendship! Thank you for taking care of her, as she is a precious gem, who is irreplaceable!! Love you Ali!! What a story of courage. Ali, we recall you when you were younger, lost track and now, we are so gosh-darned amazed at this story. This is something that is such an inspiration for just anyone. If Ali can do all that, anyone can. Keep on going – make everyone know you are a role model for others. Thank you both for your kind words and for reading Desert Health! We will be sure to pass them along to Ali! Thank you for your kind words, Steve! I can only take credit for publishing this incredible story – the words are those of Ali herself and Coach Vic. They have certainly touched many hearts. Thank you, Kelly! Will be sure to pass this on to Ali. Thank you for reading Desert Health. We are so proud of our daughter, we were some of the ones that she shut out of her life. We would email daily, she never said a word about training or finishing her marathon. She sent the newpaper announcing her marathon we are so proud of her, her two nephews said they didn’t know that there Auntie Ali was a celebrity. We have been cheering her running prior to the 5 1/2 years ago, so this was a very memorable to hear that she accomplished her dream. Love Mom & Dad. Also 50 people in Calgary have responded to my emails to them they are all so happy with Al’s hard work. Thank you for your kind words! I will be sure to pass them on to Ali. We feel lucky to have her here in the desert. And thank you for reading Desert Health! Ali agreed to embark on the challenge of training though anticipated pain for her first marathon. We wrote her account with the hope that her incredible story would inspire others and indeed it has. We will continue to write updates for all of you so that you may follow our training for the 2019 Boston Marathon which, with her 3;48 at Ventura, qualified her for the the oldest continuously run marathon in the world.